It has been nearly a week since the Chicago Cubs ended their 108-year championship drought. Now that the season is over, the league is handing out yearly awards to the absolute around the league. Soon, we’ll find out if Chicago Cubs’ Jon Lester or Kyle Hendricks will emerge as a Cy Young winner. As for skipper, Joe Maddon, he finds himself in a tight race with Dusty Baker of the Washington Nationals and Dave Roberts of the Los Angeles Dodgers. Meanwhile, shortstop Addison Russell had some solid company in his department. San Francisco Giants’ star, Brandon Crawford was one of three Giants to win Gold Gloves. Clearly, one of the best defensive teams in the National League. However, they had problems preventing the Chicago Cubs from reaching the National League Championship Series. A series which put the North Siders up against another West Coast team for the second time. Now, let’s get down to business. It has been an excellent season for a handful of players on this World Series roster. From clutch hits to pitching gems to fantastic defensive plays — two men were honored. 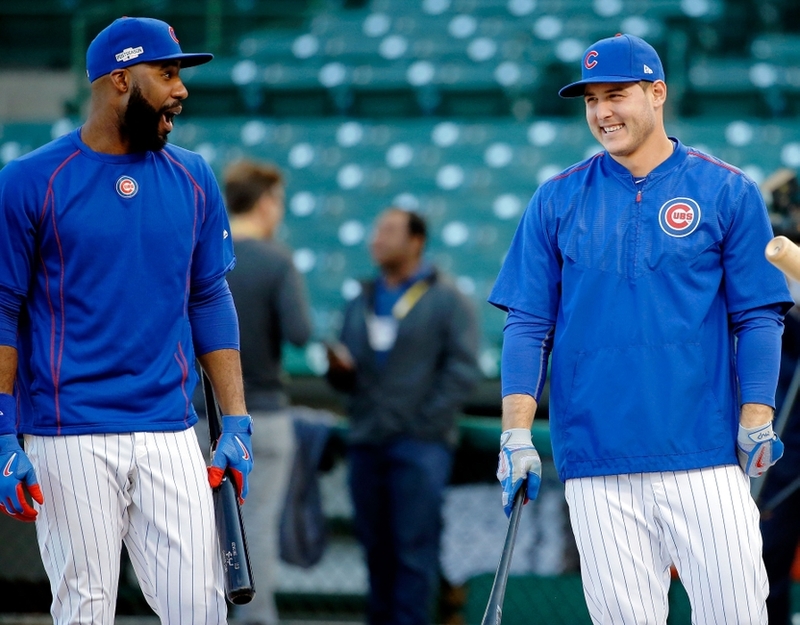 When Theo Epstein went out and signed Jason Heyward, it wasn’t necessarily all for his offensive production. Heyward is a fine defensive player, in fact, one of the absolute very best at his position. Signing that massive eight-year deal with the Cubs has clearly worked out in the end. Winning a World Series and flashing his leather at the same time, without making much noise at the dish. As of right now, Jason Heyward holds the most Gold Gloves among his teammates. Considering the fact that he has been around for awhile. The 27-year-old veteran won his first two Gold Gloves with the Atlanta Braves. Him relocating to the St. Louis Cardinals had no impact on his defensive play, thus resulting in him winning his third in 2015. Once his time with the Cardinals was up, it was time to begin another journey with a long-time division rival, you guessed it, the Cubs. Remember, Heyward launched his first career homer off the Cubs back in 2010. Now he’s a World Series champion with the club. And to add to his future Hall of Fame resume is his fourth Gold Glove as announced on ESPN Baseball Tonight. In addition, Heyward has become the youngest outfielder in Cubs history to earn an award such as this one. Congratulations to J-Hey for a fantastic season. He’ll likely be a candidate to win again in 2017. Honestly, the world can’t get enough of the Italian Stallion, Anthony Rizzo. Rizzo is the centerpiece of this World Series team. Drafted by the Boston Red Sox, traded to the San Diego Padres and finding a new home with the Cubs — Rizzo was destined for greatness. Anthony has made multiple highlight plays over the last few seasons, including a couple of plays on the tarp. A few that have been played throughout the regular and postseason. Despite the fact that he’ll likely fall to Kris Bryant for MVP honors, he can add Gold Glove winner to his resume. Rizzo was the first Cub of the night to win the award. Like his teammate out in right field, Rizzo is the youngest first baseman in franchise history to win this honor. Back in 2005, slugger Derrek Lee won both the Gold Glove and Silver Slugger award. Prior to Lee, the last Cub first baseman to win a Gold Glove was Mark Grace who did so in back-to-back seasons in 95-96. As for right field, not even Sammy Sosa could win one. Heyward joins the list of Bob Dernier and Andre Dawson of being the only Cubs outfielders to win Gold Glove awards. Small list but in good company.